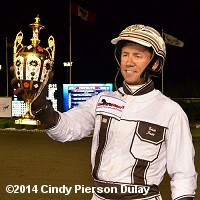 Driver Brian Sears celebrates with the North America Cup trophy. 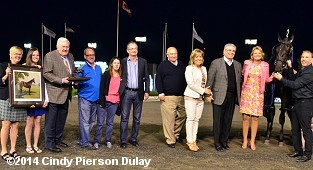 The 31st running of the $1 million Pepsi North America Cup, the world's richest pacing event, was contested on Saturday night at Mohawk Racetrack featuring the best 3-year-old pacing males in North America going the standard 1 mile trip around the 7/8 mile stonedust oval in Campbellville, Ontario. A full field of 10 lined up behind the starter under cool weather for mid-June, a clear night with post time temperatures in the high 50's and a light breeze. Tellitlikeitis was sent off as the 2-1 favorite in the full field of 10, winner of 4 straight including the Pennsylvania Sires Stakes and his Cup elimination. 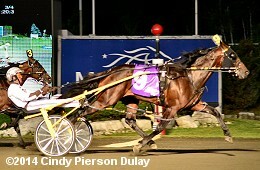 In to challenge him included 3-1 second choice McWicked, second in the Somebeachsomewhere before winning his elimination, and 7-2 third choice Lyonssomewhere, winner of two allowance races at Meadowlands followed by an elimination win here. Lyonssomewhere was quickest away and set an opening quarter mile of 25.1 before 11-2 fourth choice Hes Watching took over down the backstretch through a half in 53.2 and 3/4 in 1:20.3, while stalked by Tellitlikeitis. Hes Watching opened up a 1 1/2 length lead in mid-stretch but 12-1 JK Endofanera, 7th early and parked wide around both turns, closed with a rush to win by 1 1/2 lengths over Tellitlikeitis in 1:48.4 over the fast track. It was another length back to Hes Watching third. 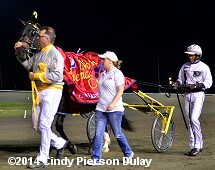 JK Endofanera wins the North America Cup. Results chart Race 10 Left: The winner's circle celebration for JK Endofanera. 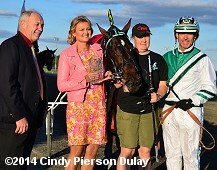 Mickey Burke, assistant to trainer and brother Ron said, "After last week (finishing third) we had to revamp. We took the Murphy (bridle) off the inside to straighten him out a little bit and put the blinkers on to concentrate him. 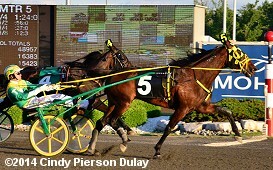 We brought him out here to train him a good mile on Tuesday and he responded to it." Right: JK Endofanera returns after the race. This is Sears' second North America Cup win, and the first for Burke and owners 3 Brothers Stable (Alan, Steven, and Ronnie Katz) of New York. Left: JK Endofanera warms up earlier in the evening. Winning driver Brian Sears said, "The trip worked out beautiful. I followed McWicked and he took me where I needed to go. A second-over trip. My horse never saw the fence. Ronnie and (brother) Mickey did a terrific job getting this horse ready for tonight. I always thought highly of this horse. He won a big race for me last year at two (Governor's Cup). Right: JK Endofanera in the post parade. Sears added, "The last couple of weeks I thought he was a little off his game. They made some corrections on him and it really worked out well. I didn't really see the fractions until I saw 3/4 in 1:20 and a piece. I said they've got to come back to me just a little bit. My colt wasn't real aggressive, but when I called on him, he showed up. It's a week-to-week thing. When you're hot, you're hot. When you throw in a bad one, they forget about you." Left: Second place finisher and beaten favorite Tellitlikeitis at the front shortly after the start. Driver Brett Miller said, "I was leaving out of there pretty hard and I didn't want to get away too far back. It was a big first quarter. I moved him to the front and He's Watching came at me so hard that I had to let him go. If I park him, I think it would have been suicide so I let him go. I sneaked up the rail for second and he raced huge." Right: Third place finisher Hes Watching warms up before the race. 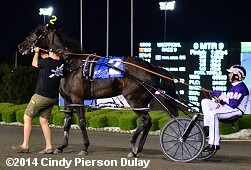 Driver Tim Tetrick said, "I got in a spot where I was either going to be first up a long way so moved him to the front and he got a little away on me around the turn, but he still raced great." There were five other stakes races on Saturday night. 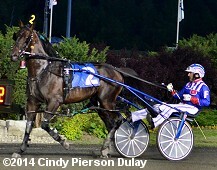 Kicking off the stakes action was the $272,100 Goodtimes Stakes featuring a full field of ten 3-year-old trotters. 9-1 Flyhawk El Durado was quickest away and set an opening quarter of 27 seconds before 17-1 Harper Blue Chip took over down the backstretch through a half in 55. Turning for home, 1-10 favorite Trixton, who stalked the pace wide throughout, came out and swept to the front through 3/4 in 1:22.4. 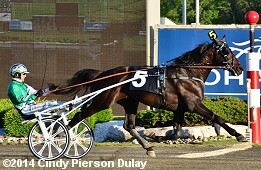 Kept to task by driver-trainer Jim Takter, Trixton cruised to a 6 length win over 19-1 Il Sogno Dream in a new Canadian record time of 1:51.3. 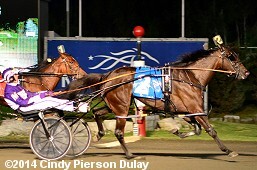 It was another 1 3/4 length back to Harper Blue Chip third. Left: Trixton in the winner's circle. Right: Trixton parades after the race. 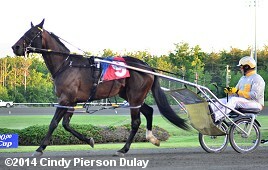 Driver-trainer Jim Takter said, "The track is a little bit loose because of the sun. He had to work hard for it. It was top speed. I had to do a lot of work to get where I wanted to be. Great horses overcome anything in this game. I haven't asked him for everything yet. I never popped the plugs on him. He's still within himself. I know he's an honest horse. If some horse comes and challenges him, he definitely will put in another gear. This horse is bred to be a great horse and he's definitely showing he has the ability. Setting a record on this track tonight, it's an achievement. 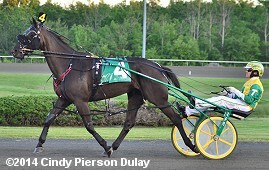 He'll have a couple of weeks off then he'll go in the Stanley Dancer at the Meadowlands." 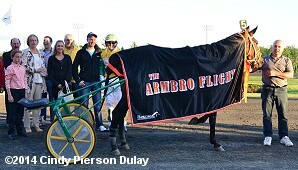 A full field of 10 faced the starter in the $271,470 Armbro Flight Stakes for trotting older fillies and mares. 3-1 second choice Bee A Magician was quickest away through an opening quarter of 27 second before 1-2 favorite Perfect Alliance took over through a half in 56 and 3/4 in 1:24. Turning for home, Perfect Aliance opened up a 2 1/4 length lead but 5-1 third choice Classic Martine, who stalked the pace in 3rd, closed late to win by 1 length in 1:52.1. 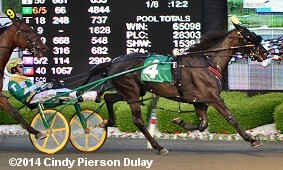 It was another 2 1/2 lengths back to 87-1 Rockin With Dewey third. Left: Classic Martine in the winner's circle. 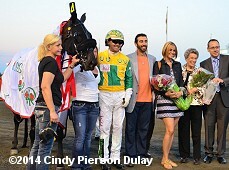 Winning driver Tim Tetrick said, "Leaving the gate there I wanted to get out and get a position. I was content sitting behind those two great mares (Perfect Alliance and Bee A Magician). Luckily I got to squeeze out at the top of the lane and my mare trotted to the house really well. She is so quick off the wings and when she gets there she will follow and she is very content to sit in. When she gets room late, she can really get to the house. Right: Classic Martine parades after the race. The daughter of Classic Photo-Drinking Days has a lifetime record of 16-8-4 from 32 starts. She improved her earnings to $718,424 for owners Hauser Bros. Racing Enterprises LLC, Susan Oakes, Conrad Zurich and Edwin Gold. 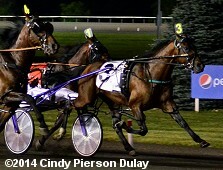 The $330,000 Roses Are Red Stakes featured a field of 10 older pacing mares. Driver Tim Tetrick sent 6-5 favorite Anndrovette to the lead and she set fractions of 26.3, 54.3, and 1:21.4 while 1 1/2 lengths in front of 44-1 Rocklamation and 3-1 Yagonnakissmeornot. Entering the stretch, 5-2 second choice Somwhereovrarainbow gained a short lead but Anndrovette fought back to win by 1 length in 1:49.1. It was another length back to Rocklamation third. Left: Anndrovette in the winner's circle. Owner Jeff Bamond said, "She's just spectacular, I mean she never ceases to amaze me. Every week you think she's beat, she comes back, every week she is just phenomenal." Anndrovette has won the Roses Are Red three consecutive years. This is her 39th career win and pushes her earnings to over $2.9 million. Right: Anndrovette warms up before the race. Winning driver Tim Tetrick said, "I kind of let her set her own pace, got a second quarter breather in :28, and I just let her keep rolling. She was passed down the lane and she gutted it out and came back and fought the other one off. She's got something most horses don't and that's determination. 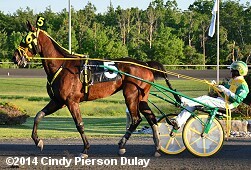 She just hates to lose and likes to race, she is just a great mare." 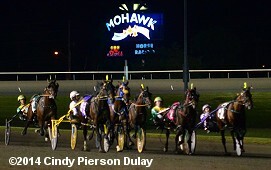 After 1 scratch, a field of 9 older pacers contested the $100,000 Mohawk Gold Cup Invitational. 5-1 Bettors Edge set the pace through fractions of 26.4, 55.3, and 1:22.4 while stalked by 7-2 Foiled Again and 3-2 favorite State Treasurer. Bettors Edge continued to lead to the 1/8 pole, but 81-1 longshot Evenin of Pleasure, fifth early, closed late to defeat Foiled Again by 1/4 length in 1:49.2. It was another 1/4 length bac to Bettors Edge third, and another 3/4 back to favorite State Treasurer fourth. Left: Evenin of Pleasure in the winner's circle. Right: Evenin of Pleasure parades after the race. 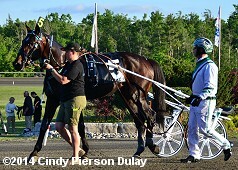 Driver Sylvain Filion said, "It worked out perfectly. We had a good post and I was fifth on the rail and I decided to stay inside so I wound up third around the last turn. He kind of swelled up on me and I was looking for an opening and we got it late in the mile and he just blew past them. I don't think he can beat these horses every week, but once in a while I think he'll have a shot. He's still young and he's on his way to improve and hopefully he'll be able to race against these horses week after week." The $457,500 Fan Hanover Stakes is the distaff counterpart to the North America Cup, with a field of ten 3-year-old pacing fillies. 76-1 Take That Hanover was quickest away through an opening quarter of 26 seconds before 5-2 Nat A Virgin took over down the backstretch through a half in 54.4 and 3/4 in 1:23.2. Nat A Virgin led to the 1/8 pole by 8-5 favorite Uffizi Hanover, who stalked the pace the whole way, gained the lead late to win by 1 1/4 lengths in 1:50.4. It was another 3/4 length back to Take That Hanover third. Left: Uffizi Hanover in the winner's circle. Co-owner Marvin Katz said, "I'm incredibly proud of her, but the real credit here has to go to Al Libfeld, my partner (who convinced him to purchase the filly). When good things happen, like I said last year, it really feels like you're on top of the mountain." 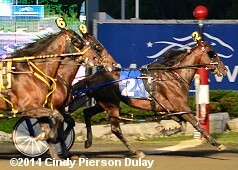 Right: Uffizi Hanover parades after the race. 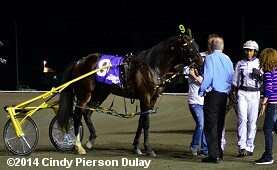 Driver Dave Miller said, "We had a good post, the inside [post two] so I used it to our advantage and got away close. It worked out where I could get her back to the lead and we got covered up and got out at the head of the stretch and just fired."